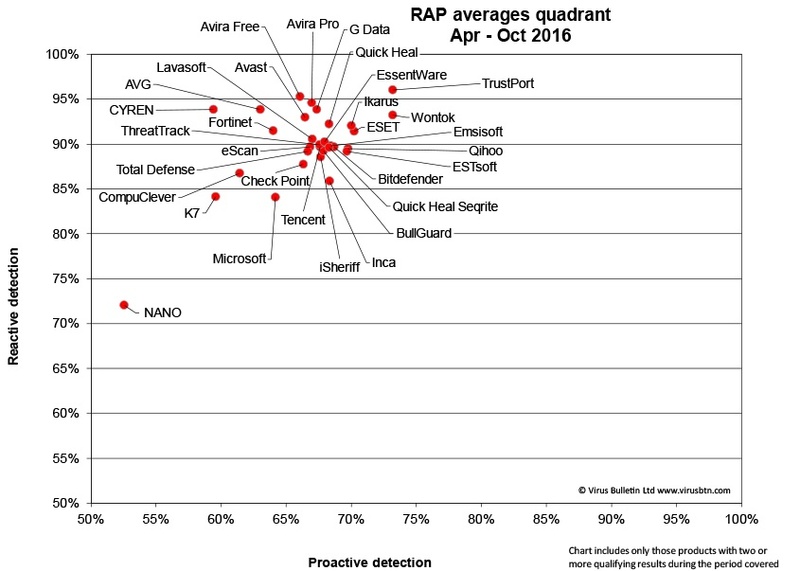 We all had the nagging suspicion that antivirus is not cutting it anymore, but the following numbers confirm your intuition. I have not seen more powerful ammo for IT security budget to transform your employees into an effective "last line of defense": a human firewall. I have covered Virus Bulletin here many times, and have kept track over the years since this is the industry I lived in for 10 years before KnowBe4, and why I started this company in 2010. Virus Bulletin (VB) is the AV industry's premier "insider site", and shows how good/bad endpoint detection rates are, but VB also covers spam filters, and tests them on a regular basis. 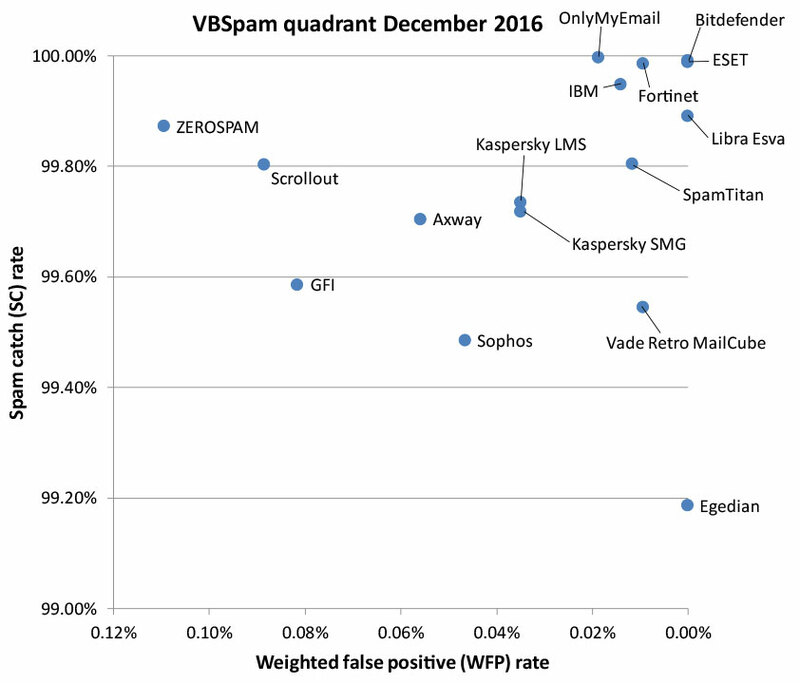 Both antivirus (aka endpoint protection) and spam filter tests are published in quadrants graphing the results. What most people do not know, is that participants in this industry all share the same samples, and it's often just a matter of who gets the definition out first, because soon enough everyone else has that malware sample and blocks the hash. 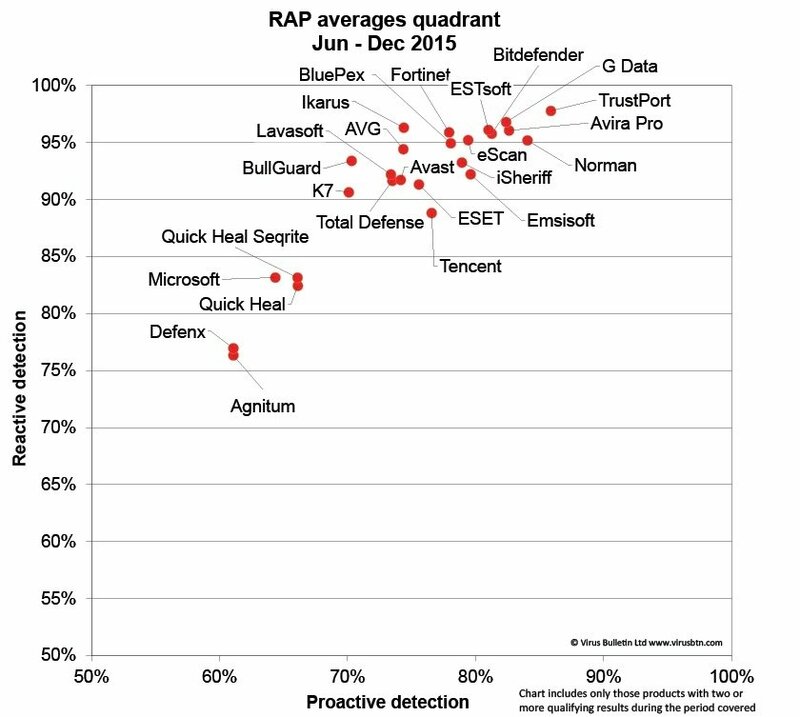 Well, there is bad news: your proactive antivirus detection rates have dramatically declined in 12 months. Next, look at the same midpoints a year later for April-Oct 2016. Note that reactive detection dropped a little bit and now clusters on the 90% line, but if you eyeball proactive detection, it has dramatically dropped to 67-70%. You would expect that with modern machine-learning techniques, proactive protection would improve, but it is going the opposite direction. By the way, if your AV is not here, the vendor declined to participate, and you can draw your own conclusions about why. Martijn Grooten at VB commented on VB's most recent spam filter test that ransomware would be much worse if it wasn't for email security solutions: "Many experts believe that ransomware is set to become an even worse problem in 2017 than it was in 2016 — which is rather bad news, given the damage it has already done. Now, let's have a look at that number of 1 in 200 making it through. Simple math shows that 100+ billion spam emails are sent every day. Of those, 2.3 billion have a malicious attachment. One half of one percent (one in 200) of those makes it through the filters, showing a surprisingly high number of 11,500,000 every day. But let's be conservative and just say millions. And that is just looking at malicious attachments, of which these days 93% are ransomware. Keep in mind that the bad guys are also very active with CEO Fraud using a spoofed "From" email address, and even more important, the most vicious attacks (like the hacks into the Clinton campaign) were based on a simple social engineering spear phish. The above makes a very strong case for a brand new look at your last line of defense, your users. It makes all the sense in the world to transform them into a human firewall ASAP, and keep them on their toes with security top of mind. Step them through new-school security awareness training which combines on-demand interactive, engaging web-based training with frequent simulated phishing attacks right in their inbox. This is a very effective approach, with the best ROI of practically any IT security tool. We have just received a Forrester Total Economic Impact report that shows an ROI of less than a month.